Heritage Seeds ensures prosperity. Our efforts are focused on achieving growth and germinating success. Providing the best quality and large variety of Tomatoes, Cauliflower, Cabbage, Chillies, Capsicum, Bottle Gourd, Sponge Gourd, Brinjal, Watermelon, Onion. 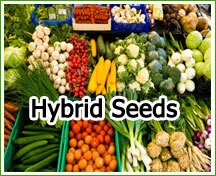 We strive to be the leader in producing and selling seeds to customers locally and globally. We offer different types of tomato seeds - Tomato Anjanta, Tomato Manish H-518, Tomato Megha, Tomato Vidhata, Tomato Aastha, Tomato Tarang, Tomato Ganapati. In cauliflower we offer Cauliflower Early Himgiri, Cauliflower Agehni. Cabbages variety includes Cabbage Hari Kalyani, Cabbage Green Star. Then we have Chilli Champion, Capsicum Shiv Priya, Okra(Bhindi) Geetanjali, Water mellon Madhulika and many more.